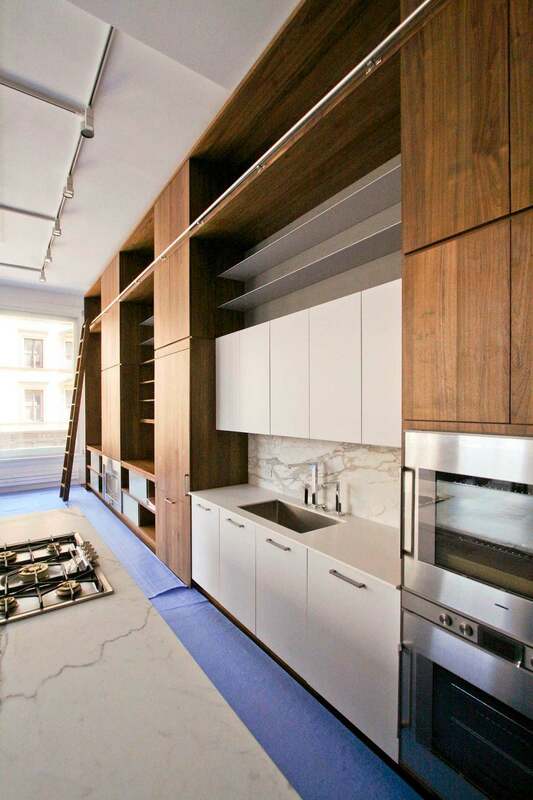 CNN STYLE, "The 'Prefab' Housing Resurgence Rolls On"
RES4's West End Avenue Apartment Featured in Luxe Magazine. Construction on the Upper West Side Townhouse is nearing completion. Check out a few images of the progress. 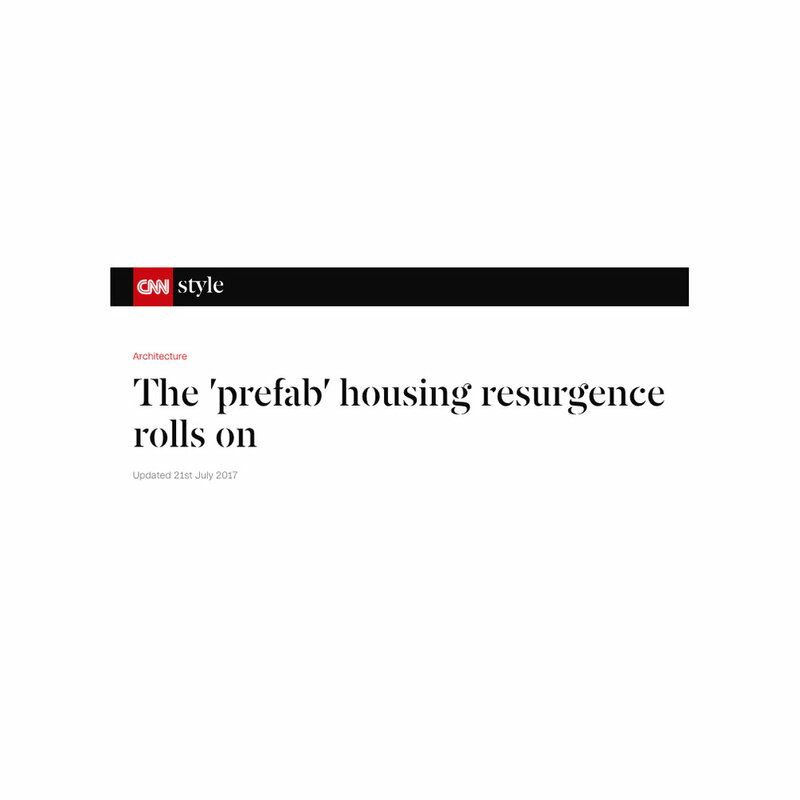 Res4 re-featured in PreFABiana article: "In Search of Modernism's Holy Grail"
Res4's Modern Modular featured in Treehugger Article about Modular construction. RES4's Dwell Home will be going up for auction in Chatham County North Carolina. Click the Image to read more. Framing is underway at the Hudson River House! The wood-framed cantilevered "bar" sits on top of a steel frame. Roof joists are being installed and interior partitions are going up. Sheathing, the roofing membrane, and windows will be next up in the coming weeks. Check out a few photos of the progress! Exterior Perspective - A long wood-framed "bar" that contains the home's communal spaces and two bedrooms sits on top of a steel frame. Exterior Perspective - The "bar" extends past both sides of a 2-story circulation volume that contains a staircase and small elevator. Interior Perspective - Large floor-to-ceiling- windows in the Living Room will frame views of the Hudson River. DWELL HOME - NOVEMBER 15TH AUCTION! The RES4 Dwell Home is on the auction block! The "Mother of All Modern Pre-fab Design" will be auctioned on November 15th in Pittsboro, North Carolina. RES4's Douglass Street Townhouse Featured on New York Time's "Find A Home". The North Carolina Modernist Houses is going to be giving a tour of RES4's Dwell Home on Oct.29. 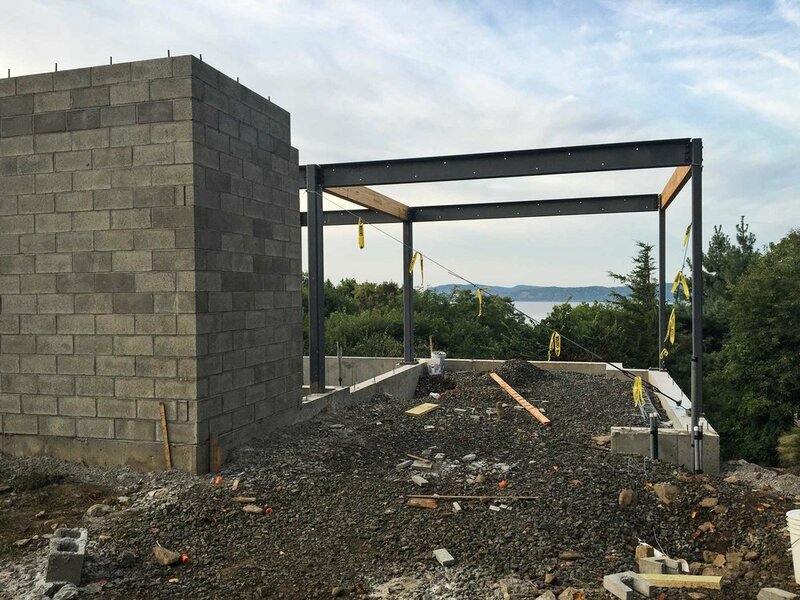 Croton-on-Hudson, New York -- Framing is underway at the Hudson River House! The structural steel frame has been erected and wood framing is being installed at the cantilevered pool deck. Steel Frame & Pool Deck -- A steel and wood pool deck cantilevers over a gabion retaining wall. The steel columns and beams are getting ready for the "bar" house to be framed above. Carport & Entry -- The future driveway will slide below the house and frame a fantastic view of the Hudson River beyond. Circulation Volume -- The CMU wall wraps a stair and elevator core that will take users up to the main floor of the house above. 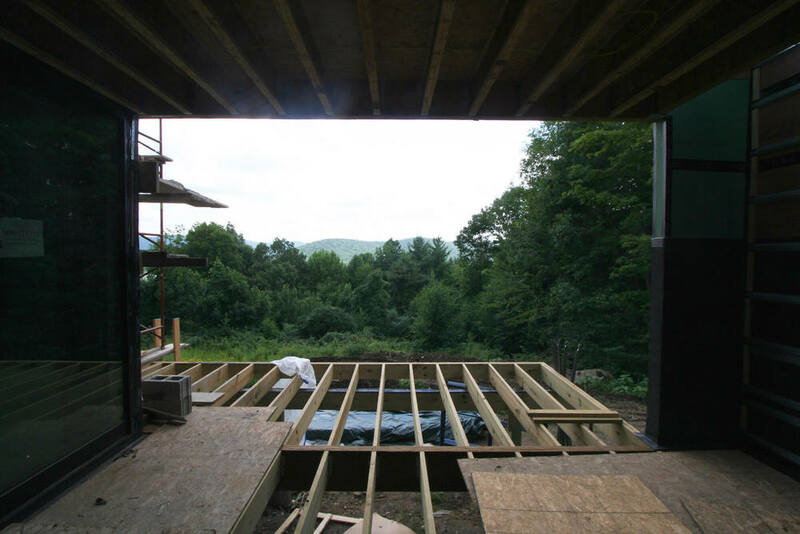 Cornwall, Connecticut - Progress photos from our latest site visit to the Cornwall Cabin. 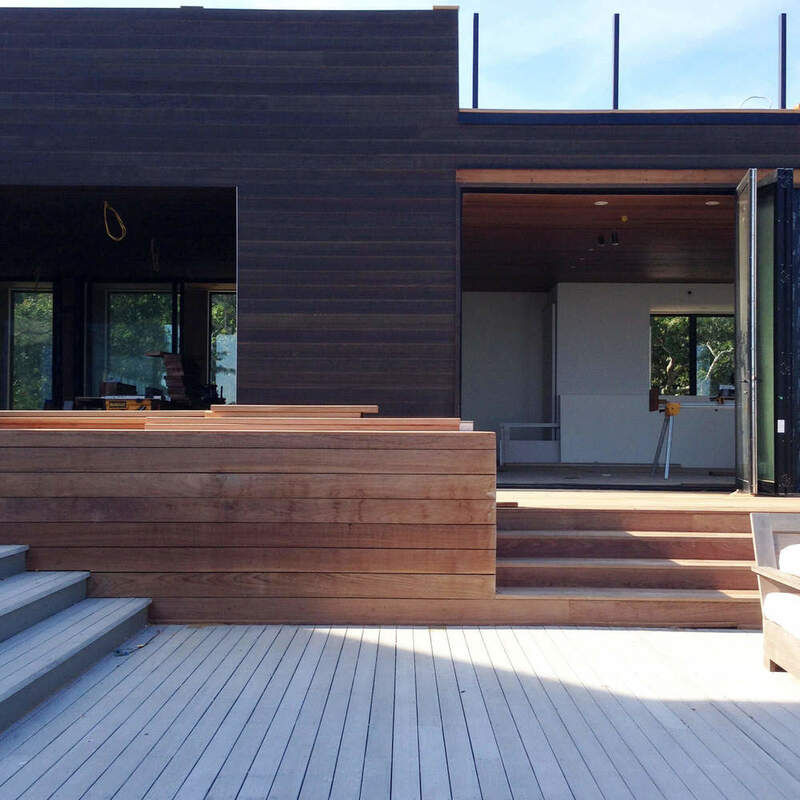 Amagansett, NY - Take a look at some construction photos of our prefab home in Amagansett, New York. Enclosed deck space - A stained cedar wall separates a partially enclosed deck space from an exterior stair leading to the roof space. Exterior Bench - Ipe bench and risers align with the cedar edge and sliding glass doors beyond. Detached Garage - Steel framing and exterior sheathing has been completed. Roof Deck - Ipe decking and bocce court installation are in construction. Kitchen and Mezzanine - Calacatta marble island and backsplash; Gaggenau appliances; Dornbracht plumbing fixtures; walnut and white lacquer millwork; white powder coated steel shelving; stainless steel trim; glass railings. Library Wall - 14-foot high ceilings provided the opportunity to design a massive "Library Wall", complete with rolling ladder. The kitchen and a fireplace are incorporated into the giant millwork unit. Communal space (living room, kitchen, dining area, and study/sleeping loft above) - 14-foot high ceilings allow for a study/sleeping loft accessed by a Walnut spiral stair integrated into the "Library Wall". Guest Bedroom - Murphy Bed integrated into the Walnut millwork with side cubbies and storage above. Guest Bedroom - Built-in Walnut wardrobe and nearly 11-foot tall high-gloss white lacquer door with stainless steel door frame. 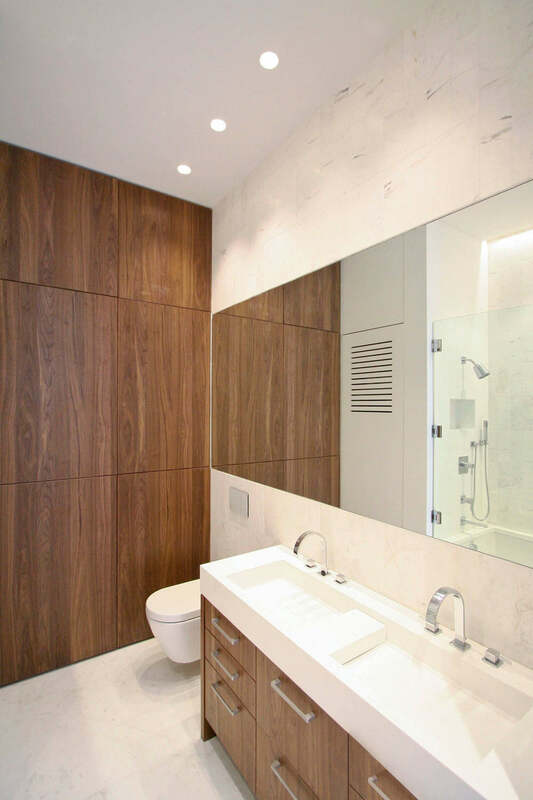 Guest Bathroom - Walnut vanity with custom-designed Corian sinks; built-in Walnut storage unit; marble tile; and integrated Corian laundry closet. Master Bathroom - Calacatta Gold marble tile throughout the Master Bathroom; glass shower enclosure yet to come. Cornwall, CT - Image of second module of cornwall cabin being set into place above first module and concrete foundation. Brooklyn, NY - Exterior cladding coming along on the Park Slope Townhouse. Below is a view of the Street facing exterior elevation. Amagansett, NY - First day of the scheduled 2-day set for this massive 14-box addition. New York, NY - Most of the sheetrock work completed over the walls and ceiling throughout the townhouse. Amagansett Addition modules being assembled in the factory. Construction workers acting as counterweights to move the roof section into place.